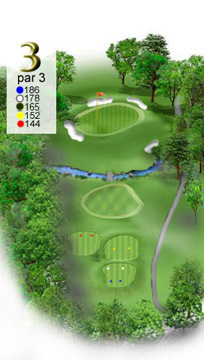 This par 3 will test your skills. Hit it short and you could find yourself in a rock lined stream. Hit it left and out of bounds is awaiting you, to the right and trees will assure you of fabricating a shot to the green. Several bunkers often come in to play for other off line shots. There is water to the right but it doesn't come into play, unless you hit it really, really bad.